Today’s standard interpretation in geophysics is subduction theory / plate tectonics theory (PT). The key assumption in PT is “constant speed”. Today continents drift a couple of centimeters per year. The world has trenches, which are considered to be subduction zones, and mid oceanic ridges, which are considered to be spreading ridges. Sinking slabs are believed to be the driving mechanism of the process, and the process in the interior of the earth is considered to be similar to a lava lamp. Current continental movement speed is extrapolated to the past. But is that valid? 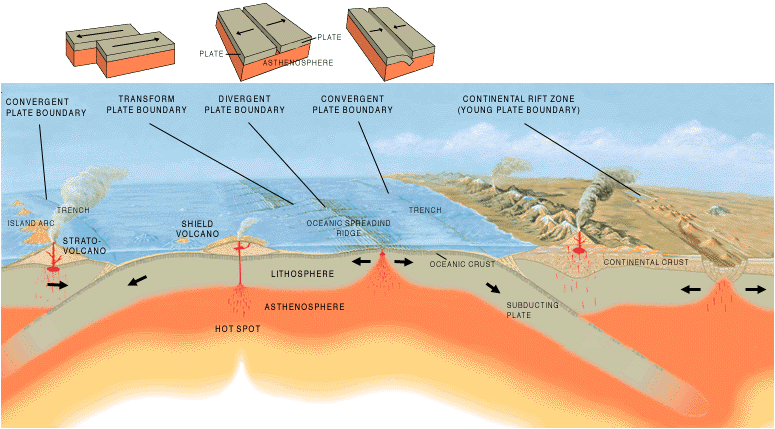 A cross section illustrating the main types of plate boundaries. (Photo credit: Wikipedia). Note that this illustration contains both (hidden) assumptions and facts. They are all presented as facts. It is commonly suggested that there have been 7 historical super-continents in the past. But how can subduction reverse? How did the earth’s crust break into plates? Why are there hardly any sediments in trenches? Plate tectonics theory demands mantle material to come up at the mid-oceanic ridges, which should be a return flow of the material that subducts at trenches. Seismic data shows no return flows at all. Gravity measurements shows there is far too little mass at trenches to support the theory: there is no evidence that subducting plates exist. Plate tectonics theory demands a uniform mantle for the mechanism to work. Though the mantle clearly shows large density (material) transitions at depths of 660, 1000 and 2000 km. This means plate tectonics simply cannot work. Next, we move on to the unbiased observations. From there we will start to draw conclusions. After that we will make predictions, and compare that to more facts.